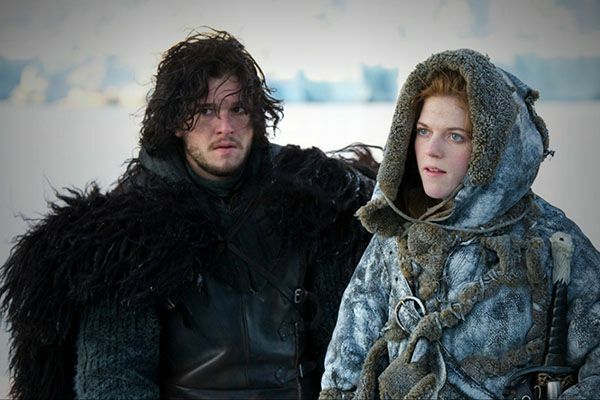 did Jon pull a knife on Ygritte in the middle of the night? Unclear, but it looks like he did pull a nice pinot from the wine cellar! It’s a well-documented fact that pretending to be vampires has a way of bringing co-stars together (and, yeah, driving them apart), but this is the first time we’ve seen the aphrodisiac combination of stinky pelts and frostbitten genitalia work its magic on two attractive young thespians. With Season 3 already in production, and Harington and Leslie likely making dry-hump snow angels in the Icelandic tundra as we speak, concerns are running high about the nearby polar ice caps and about the contributors to fuckyeahwildlings.tumblr.com being able to withstand the heat of this romance. Double hat-tip to TMZ for not only breaking this story, but for giving us solid evidence that they should probably start recapping the show come Season 3.
if Ned Stark found out about this, he would lose his head. A Clash of Kings? More like A Clash of ZINGS! Which Rappers' Houses, Other Than LL Cool J's, Should You Be Breaking Into?